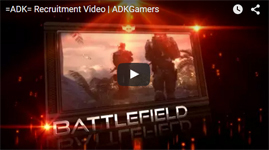 =ADK= Battlefield 1 Server Finally after long time waiting from DICE to give us something that we may get members from and something that we will really use has come . Since the game released we were not able to rent any server at all for BF1, the reason for that is the resources that we need in the game to control the server player behave just like "Kicking,Banning...etc" , But finally they have gave us something will help us out to manage the server . After We "BF staff" talked about how many servers we want to our community , we decided to go with one for now and in the future we can bring more and more . In the coming screenshot you will see our server settings and the name of it , Please Add the server to your Favorite list and kind help us populating it when you are free . Note : Cause i live in the Middle East for sure i will have that ping , you will get less that's for sure . Please tell your friends about it and join us in the server so we can have great times , And make sure to join our OFFICIAL ADK Platoon , You can visit the bellow link to see how . See you guys in the field . Hi I just had a question about the 10hr requirement on ADK servers. Correct me I'm wrong but I don't believe there's an H1Z1 ADK server. If I'm playing that with other members will that still count towards the requirement? Thanks if anyone can enlighten me. Off topic how do you attach pictures to a reply in the forums. I was having trouble. This is a side project while my parts come in for my new PC. Check that post out here. So my parents had this old computer that they don't need and they said I can use it unless the one just like it stops working for whatever reason. It's kinda old and it still has a floppy disk drive which is so dope so I decided to finally make that home server I always wanted. Here's a list of things I want it to do: Backups Apple AirPrint and whatever for Android - I already have my printers wireless for PCs with my router and "D-Link Shareport" on my router but I want to extend it to my parent's phones and tablets(iOS) and my phone(Android-Galaxy S6 Edge) Minecraft server(at some point) Media Streaming(Plex maybe) More Backups Other Stuff I'll remember later My first problem is that I can't decide between FreeNAS and Windows Server 2012 R2. I get WS for free as a student. Also would I be able to dual boot it without reinstalling Windows 7 or erasing ANY of the files and software on it? My parent's need this computer if the one at their work fails and it needs to be as is. I'm thinking maybe create a recovery disk, partition it, and then reinstall Windows 7 on a reduced partition through the recovery disk. Floppy Disks are dope! Server downtime for NA, EUW, EUNE, LAN, LAS, BR, and TR will begin on November 5th at 0130 PST. All ranked queues will be disabled and all games being played at that time will end in a draw and no stats will be recorded. Downloads for patch 4.19 will be lengthy as it will have the last files before the big open beta begins. A list of what they are including in or during this patch follows. -Reaper Soraka skin -Singed model/texture update -New Singed ability icons, 18 new splash arts (Blitzcrank, Ezreal, Gragas, Graves, Janna, J4, Kayle, Rengar, Rumble, Shaco, Shen, Singed, Talon, Tristana, Udyr, Veigar, Wukong, Zilean -New summoner's rift login screen -The 2014 ranked rewards - Victorious Morgana, ranked team wards, summoner icons, etc. (Note: These will NOT actually be handed out until the end of the season which is NOVEMBER 11th!) -New shop assets (item images) -The rest of the files for the new summoner's rift The experimental preseason changes (new jungle camps, new map, changes to dragon, etc.) are NOT in this patch. Just letting everyone know that if you experience the Battlefield 4 servers going down, it's expected. There is an update that is being pushed to all servers right now. Once we find out what is in this update from EA/DICE we will let you all know! Some of you might have seen the servers go down. This was due to an update that was pushed by DICE. It's the server version R39 for Battlefield 4, but like always we're not certain what's in it. When we find out we will let you know! A couple days ago I decided I would try and work hard for a little bit to try and get member status. The requirement is that you have 10 hours on an =ADK= server. Is there a way to check hour many hours I've played on a certain server on Battlefield 4? I'm very new to the community but, myself and quite a few others I am bringing with me to ADK are fans of 32 player servers. I personally like infantry maps with 32 players like Op. Lockers. I know that ADK only has 64 player servers atm but, I'm hoping that maybe I can get some supporting votes and maybe reach someone about the possibility of starting a 32p. Thanks for the consideration and it's great to be here! Edit: I also wanted to mention that I would obviously be a regular there and very willing to help pop it on a regular basis. Has anybody noticed any server lag? I have a 12ms ping on the servers, but everything seems a bit behind, when I play on other clans servers there's no lag. Tonight there was a discussion with some of the BF3 advisors in TS, a new server type was brought up. Making a VoteWeapon server. I have not seen this done before and currently i do not see any server or procon plugin that is currently using this concept. This is what VoteWeapon would consist of: At some point before the next round, a question would be asked by procon plugin. What weapon (besides knife) will be the only weapon allowed next round. We can possibly not allow the vote for really popular weapons like m16A3, or m4A1 just to make it more interesting. If you don't have the decided weapon unlocked, you have to use the knife. Any usage of other weapons results in an autokill by admin. The weapon that gets the most votes is the only one (besides knife) allowed in the next round. This would completely change the dynamic of matches for every single round. Suddenly one round all you can use is magnum, then only 870, then only grenades. The group of maps we were thinking about using for this are close quarters. I am a senior software engineering student and would be willing to attempt a writing a procon plugin for this. The only thing that worries me is the fact that i cannot find any existing plugin for this, i doubt we were the first to come up with this idea, which makes me think people ran into trouble implementing it. This was an instant hit with everyone in our channel, but let me know your thoughts on implementing this.